I recently bought my first sword for training, this one, and after a month of usage, mainly doing some cuts and swings in the air about 30 mins per day, I started to hear a 'clicking' sound, as if something was loose in the hilt. I'm fairly certains it's the grip, as it's hearable, when I try to twist it, but even after checking some sites and posts about it, I'm not entirely sure how to fix it properly, as it has a nut and is peened. I tried the trick with the oil (2 times) pouring it down the tang through the crossguard, without much success. My question is, should I give it a few whacks, like in this guide, or try sliding in epoxy? I planned to try out the number one first, as I seem to remember that the nut wasn't this loose as show on the pics, when the sword shipped, but can I hammer down a nut? Using the guide, should I grind out the wooden block to have a hole a bit wider than the nut and then smack it down too at the end or should I remove the nut first (whick I'm not entirely sure how)? Or should I straight up use epoxy? When you say "nut"...are you talking about the peen block? That pyramid shaped thingy resting on the pommel? 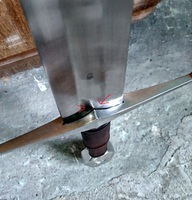 It the sword is truly peened then the peen block is just a piece of metal the essentially rests on the pommel and is held in place by the peen. If that is the situation and its loose, then I would recommend you whack it several times with a ball-peen hammer, hit right on the peen itself, that little squarish bit of metal in the middle, that should tighten things back up again. You will make some marks on the area you hit though. Basically little divots, but that is normal and if the marks bother you can always sand or grind them away and clean it up. + Please secure the sword in a vice before striking it with a hammer. Yeah, I was talking about the peen block (so what actually is the nut? 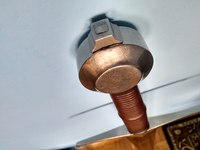 a screw in the pommel or something like that?). I will try that. Marks don't bother me at all, it's all about functionality. I'm really starting to run out of room for my Collection. Just thought I'd add to this thread, OP is right in a way. KOA List this sword as both Nut and and Peened? 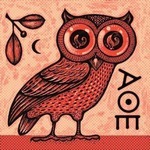 Anyone have any idea what they mean? On the Cas Iberia site they say only "hot-peened". 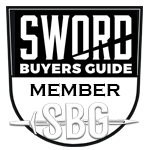 I secured my sword in a vice and gave it a few whacks, but didn't help. Maybe the wooden inside of the grip got too loosened up through my training? Or maybe it was epoxied to the begin with and the glue came off? So or so, should I now try to pour some epoxy into the sword hilt, like into the space on the pictures, or try something else? 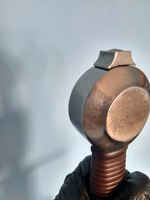 I spoke to the gentleman who owns and runs Arms and Armor about his methods, he uses a nut, and peens. He tightens down the nut to torque spec, and then peens over the threaded portion. Essentially, you are getting a completely mechanically locked nut, by way of the peen. Best of both worlds.. 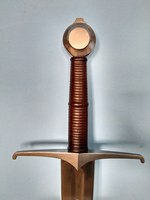 When Kult of Athena mentions a "nut" in the description of this sword, they appear to be referring to the peen block, which would not be threaded onto the tang (in this case it's clear because the block follows the curvature of the pommel, which would be difficult, if not impossible, to incorporate on an actual nut). That being the case, you should be able to tighten it up by hitting the peen until it is tight again. 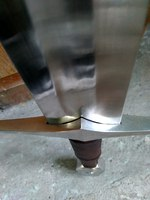 They also mention there is a piece between the guard and grip that helps secure the guard to the tang, so that may be what is keeping it from tightening fully. I'd suggest trying the peen again, sometimes it takes a bit of work to get it perfectly tight. You don't have to hit it that hard, it's just a matter of moving enough material to fill the required area. IMO I don't think epoxy would work well in this scenario. The space between the blade and guard slot just isn't very large and I don't think you'll get enough in there to make much difference.